Online advertising of any kind requires tracking and measuring the results. 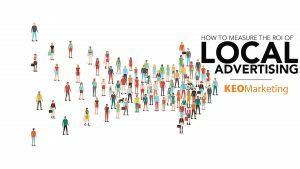 Local advertising should have the return-on-investment (ROI) measured as a separate marketing channel so that you can know how well the local community responds to your ads. If you own a small or medium B2B focused business within your city, this is even more important. But calculating the ROI of local advertising may seem a bit daunting. When using sales as your metric, look for an increase in local gross sales margin. Begin by tracking your current gross sales revenue to get a baseline. Compare that to the increase resulting from your local advertising in order to show a return on your local advertising investment. It is also a good idea to compare this figure to the gross sales margin from prior years to determine if the difference in sales was impacted by seasonality. Track incremental geo-targeted changes to traffic to your website. Unique URLs and unique landing pages can be used with each ad to determine the change in traffic to your site as well as which ads drive the most localized traffic. It is important to measure the effectiveness of your branding efforts, though it is admittedly more challenging than calculating gross sales or counting the number of people who visit your website. Impressions and engagement are metrics to focus on here. One method of tracking is to run keyword searches across multiple social networks on a weekly or monthly basis to capture mentions of your brand name and track how they fluctuate based on your advertising campaigns. Another method is to create a campaign-specific hashtag for your local advertising and track how often it is used on your targeted social media sites. What is important to remember when you do local advertising is that it is critical to track the return on budget investment. Local ads can have significant impact on your revenue, so you want to have a good idea of which geo-targeted ads are pulling in the most response so you can optimize your marketing spend.